Missives from the Art World: Will I see you in Maastricht ? The calendar tells me it’s March so I am headed for Maastricht. I certainly wouldn’t want to miss TEFAF (The European Fine Arts Fair) at the MECC. Yet another art fair? Why all the fuss? Art lovers from all over the world have booked their accommodations months in advance in or near this little town on the Maas river which has been a center of trade since the Middle Ages. They will meet and greet each other in the huge modern fair facility known as the MECC (Maastricht Exhibition and Congress Center) where TEFAF takes place. This year 260 exhibitors expect to host over 70,000 visitors during the fair which runs from March 12 - 21 with the by invitation only opening on March 11. This is not a place to go for the avant garde or the cutting edge. This is where all the curators and collectors for every other field come. The fair grounds in Maastricht are huge. So much so that the first couple of times that I attended I was continuously looking at a map to get my bearings and even to find my way to the egress, or the loo, for that matter! Nowhere else can you survey the offerings in so many fields. 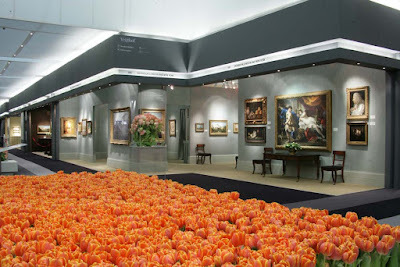 When two provincial fairs combined to form the dealer-run TEFAF in 1988 the original focus was on Old Master paintings. Recently master drawings have become an important presence. There are not that many dealers in medieval and Renaissance objects because there is not much available to collect but those who do exhibit are the leading dealers in the field. Decorative arts such as the furniture and ceramics from previous centuries, particularly Germany and the Netherlands, can be found in plentiful array together with continental ceramics and silver. Oriental art is well represented and established modern art has entered the picture with a section of the fair now devoted to the most important galleries from the U.S. and Europe. I am always writing that in order to make decisions in art collecting you have to make comparisons and this is the ideal place to do it. If you are trying to choose a field to collect in you will see more different fields than in most museums and what you see will be of museum quality. In no single country can you find as many dealers in Dutch 17th century paintings. Here you can compare the offerings from dealers in The Netherlands, Germany, Switzerland, France and England. If you just like art or trying to choose a field in which to collect you will see more different fields than in most museums, and usually of museum quality. The fair is vetted by great experts including dealers, curators and collectors to add to the security of the collector. You have to see it to believe it and experience it to know what fun it is. But a warning. While people do come for a day, DON’T the first time. You will only be frustrated and it will be just too much. One of the vetters, a prominent collector, is there for several days of vetting before the opening in his specific area of expertise and then stays three of four more days to see all that he had not yet viewed. Go and let it all sink in. There is a fancy restaurant as well as a cafeteria open all day so you can take your choice and stop regularly for coffee breaks as well even in the exhibition hall. Oh yes, if you are with someone who is not an art enthusiast but loves jewelry many of the finest jewelers in the world are well represented to cater to those who live for it. You might also plan on taking a day off from the intensity of TEFAF. Maastricht is located at the southern tip of the Netherlands, just a few miles from Germany and Belgium and France is also within a short drive. Years ago, before cell phones, I had my phone card pulled because the AT&T watchdogs could not believe that their card was used in three different countries within 24 hours! Because of that centralized location you can make some wonderful day trips from Maastricht to other great art cities and return with your eyes refreshed to take in more and more and more acquirable art.